1625 Hondius Map of Africa ADDITIONAL IMAGES AVAILABLE ON REQUEST WE SELL ONLY ORIGINAL ANTIQUE MAPS - NOT REPRODUCTIONS. 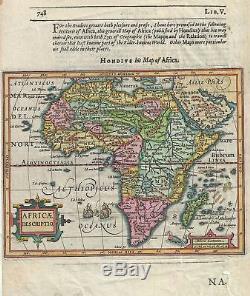 Description: This is a beautiful 1625 map of Africa by the Dutch cartographer Jodocus Hondius. It depicts the continent of Africa from the early 17th century perspective. Largely based on earlier Mercator model, this map shows revised coastlines. The map also depicts various coastal features near Madagascar. The speculative details represented on this map also highlight how little was known about the region at the time. Hondius curiously maps the Niger River which includes a great lake formed by the Niger âÃÃ¬ an embryonic attempt to map the important and unusual Niger Inland Delta. The river, moreover, runs directly eastward rather than correctly to the northeast. The Mountains of the Moon (although not so named on this map), supposed source of the Nile, are located considerably south of where they appear in other maps of the period. Early Ptolemaic maps note these mountains as well as two large lakes just to the north here called'Zaire Lacus or Zembre Lacus. Beautiful illustrations adorn the map, including two ships in battle and a whale or a sea monster in the bottom right quadrant. This map is part of Samuel Purchas' Hakluytus Posthumus, or, Purchas his Pilgrimes , a compilation of voyages to foreign countries. Purchas, an English cleric acquired rights to use Hondius' plates to illustrate his works. Size: Printed area measures 6.5 inches high by 8 inches wide. If your address is a P. We can use your Federal Express Account. Duty varies by country and we cannot predict the amount you will be charged. Some countries are duty free, others are not. Other Services Conservation Framing: Geographicus recommends basic conservation framing services for any antique paper. We do not offer this service. Antique Map Restoration: Geographicus can repair and restore your antique map. Services include deacidification cleaning flattening and backing. The item "1625 Hondius Map of Africa" is in sale since Friday, January 4, 2019. This item is in the category "Antiques\Maps, Atlases & Globes\Africa Maps". The seller is "geographicusmaps" and is located in 11221.